Analyst firm IHS predicts that the PlayStation 4 will outsell the Xbox One over the next four years by a margin of more than ten million units. Neither the Xbox One nor the PlayStation 4 are on the market yet, but that doesn't mean it's too early to start talking about who's going to "win" the next round of the console wars. According to global information firm IHS, Sony appears to have the edge, at least over the next four years, largely due to the company's "wider geographical brand allegiance" and what it believes will be only "a small amount of defections between Sony and Microsoft." 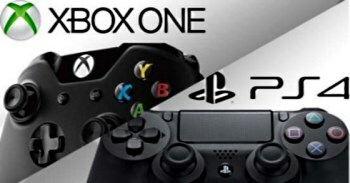 IHS expects the PS4 will dominate in Europe, the U.K. and Japan, while the Xbox One will be the stronger performer in the U.S. Sony also scored points for bringing the PS4 in at a considerably lower price than the Xbox One and for positioning it first and foremost as a games console, which the firm said "will influence the choice of some early adopters." Microsoft, however, got the nod for offering "more formidable [exclusives] for a wider set of gamers, especially in the opening launch period." Year-end numbers for 2013 are quite close, as IHS predicted that Sony will sell 2.4 million PS4 consoles while Microsoft will move 2.2 million Xbox One units. By the end of 2017, however, IHS believes that picture will have changed rather dramatically: It projects PS4 sales of 49 million units, compared to Xbox One sales of 38 million units. "IHS believes that Sony's wider geographical brand allegiance - especially across continental Europe and Japan - will be decisive in allowing PS4 to outsell Xbox One on a global basis by the end of 2017," the firm stated. Four years is an awfully long span over which to make sales predictions for products that aren't even on the market yet, but that's what IHS does and, believe it or not, there's more to this business than just guessing. Agree? Disagree? I'm staying well clear of the whole thing, but feel free to discuss!